Since the beginning, in 1996, The Cottage Company has been nationally recognized as a leader by providing new models for sustainable living and smart housing choices — without giving up an ounce of style. Our mission is to pioneer sustainable communities where homes are more than houses and neighborhoods are more than zip codes. To date, we've completed, eight connected communities in the Pacific Northwest as in-fill within existing single-family neighborhoods close to jobs and transportation. 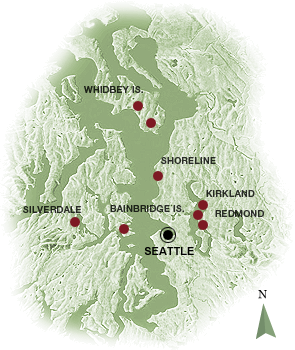 Our locations are diverse — from prime waterfront property near Silverdale, Washington to a bustling Seattle-area neighborhood, to a bucolic island town, to a tranquil woodland a bike ride from our regions technology employment centers. Yet, all of our communities are built to be: Simple. Smart. Sustainable. We strive to be good stewards of the earth, as well as creating homes that are crafted with character & charm. Our high-quality communities of compact, energy-efficient single-family homes in pocket neighborhoods are unique & powerful because they are created by related layers of privacy and connectivity. Intrinsic within that undertaking is connecting with people and environment in a simple, life-sustaining way. And, our over-riding theme is to create new housing choices that offer beautiful places where people choose to live their lives.
" Filled with simple but beautifully designed details, these homes exemplify what building 'not-so-big®' is all about "